1. Extend your autonomy : Go farther into the wilderness... and stay longer! 2. Save money : Make your adventure possible on a tight budget. 3. Bug out in case of a disaster : Hit the trail for cover and get far away from panicked and unpredictable people. 4. Make money : Get a job by just driving your upgraded Wrangler expedition vehicle from one destination to the next. 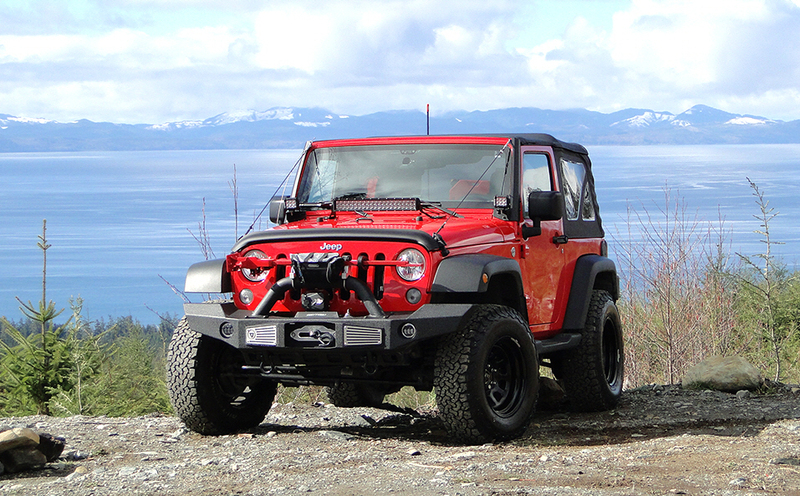 Disclaimer : My goal is NOT to convince Jeep owners that they should hit the trail alone (like I do). Rather, I want to help attenuate the risks and improve their overall experience if they make that decision for themselves. My Jeep JK is my work tool, my best friend, and the partner in crime I couldn’t live without. I have spent hundreds of days driving on unmaintained trails and logging roads, conquering nasty obstacles with no possible external help. I have slept just where I was that day, faced recovery situations with calm, or sometimes just wandered around for fun. I’m a loner used to living and working by myself in the wilderness for extraordinary long periods. Living on the trail is a lifestyle choice, and it took me lots of time and plenty of mistakes to find ways to make it sustainable. There are thousands of other online resources that off-road hobbyists and Jeep enthusiasts already know, but most of them are related to advanced driving techniques, group expeditions, complex mechanical repairs, or flashy mods. My goal was to create a resource intended to provide tips, strategies, and creative ideas to a very specific audience: lone Jeepers. Whether you are a solo adventurer, an aspiring survivalist, or a professional planning to drive and work in the bush, the purpose of this website is to help you save money, time, and hassle with to-the-point tips based on my personal experience. What’s wrong with me? I hated my office job but somehow endured the agony for 15 years. My reward: I had to deal with burnout. After being advised to take a full-blown vacation, I decided to buy a Jeep and bug out from it all. I just wanted to disappear forever in the remote Canadian wilderness. Just me, my Jeep, and nothing else. Then, I did it. Not only have I never come back, but I’ve also succeeded in making a living out of it. You won’t get rich. But if you are clever, reliable, trustworthy, and punctual, you can certainly make more money than you need to sustain that lifestyle by just driving your Jeep. Push yourself, find a new purpose every day, overcome bumpy roads and abandoned trails, meet highlycapable people, enjoy breathless landscapes, explore ridges, streams and lakes, encounter incredible wildlife, and feel the power of awareness. Breathe fresh air, lose weight, improve your cardio, eat better, reduce your alcohol intake, stop smoking/vaping once and for all, quickly detoxify your body, and reconnect with nature. It worked for me. Become more independent, confident, self-reliant, and physically and mentally stronger. Face mechanical failure, or natural disasters with just a loaded Jeep, knowledge, and the advantage of being an outsider to society. Off-roaders tend to underestimate the mobile signal coverage available deep in the remote wilderness. Before spending money on a satellite phone, a ham radio, or an air-band transceiver, maybe you should try a top-of-the-line phone signal booster for your expedition vehicle. Works on Verizon AT&T Sprint T-Mobile Bell Canada Telus and Rogers. Amphibious, highly reliable, and easy to install, this recessed winch is able to pull 9500 lbs. It’s a brutal torque output that will help a solo Jeeper to get unstuck reliably. This is the Competition model especially built for the worst unmaintained, muddy and rugged trails. The corded remote control allows you to operate the winch while you hold the steering wheel. Upgrade weak factory fog bulbs (no power conversion kit needed). Extend the range of your visibility. Be more visible on foggy nights and days. Produces a cool, subtle red beam. The lens is dense and resistant enough to take some hits. These very affordable fog lights (kit sells for less than $75) can also be used as a pretty decent source of auxiliary lighting. A complete strategy with safety, weight and budget in mind to build a Wrangler Expedition Vehicle. Follow my 4x4 adventures in the Yukon, Northwest Territories and British Columbia (Canada). Don't forget I'm in the wilderness 150-200 days/year. Please, allow me some time to reply.